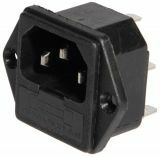 AC plug, two-pole, WT-SELV-12VAC, 16A, 12VAC, black Bipolar plug, model WT-SELV-12VAC. The plug has a nominal contact current of 16 A, a nominal voltage of 12 VAC and a protection class IP34. Power mains connector AC, male plug Connector AC, male, blue. Power mains connector AC, C13, female plug, 10A IEC 60320 network connector, AC power supply, C13, female plug 10A, 250 VAC. AC Power Socket, IEC 60320, 250VAC, 16A, 3pin, M Mains socket with power supply 250 VAC / 16 A, 3 leads (m). 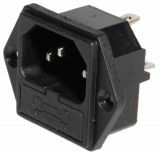 Power socket, SP-864A2, IEC 60320, 250VAC, 10A, 3pin, M Power socket 250 VAC / 10 A, 3 leads, M.
Power socket connector, АC, C14(E), 250VAC, 10A Mains socket with power supply 250 VAC / 10 A, 3 leads (m). List Price 1.25лв. VAT Incl. 1.19лв. VAT Incl. 1.12лв. VAT Incl. 1.06лв. VAT Incl. Power socket connector АC, C14, 250VAC, 10A 3-socket network socket (f) IEC 60320, female. Power connector IEC 60320, C19 (J), female 16A Power connector IEC 60320, C19 (J), female 16A. List Price 4.95лв. VAT Incl. 4.70лв. VAT Incl. 4.45лв. VAT Incl. 4.20лв. VAT Incl. 3.96лв. VAT Incl. AC Power Adapter, DB-14-F5 + RS601, 10A / 250VAC, male, with fuse holder Power socket AC, male model DB-14-F5 slot for RS601 switch and fuse slot . 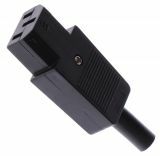 The connector has a rated current of contacts 10 A and a rated voltage of 250 VAC. Socket AC, two-pole, GN-SELV-12VAC, 16A, 12VAC, black Panel power socket AC, female model GN-SELV-12VAC. The connector has a nominal contact current of 16 A, a rated voltage of 12 VAC and an IP44 degree of protection. Power AC socket, C13 (F), 10A/250VAC, female AC power socket, female model C13 (F). The connector has a rated contact current of 10 A and a nominal voltage of 250 VAC. Power socket connector АC, C14, 250VAC, 10A Network socket, 3-pin connector for panel mounting. List Price 1.30лв. VAT Incl. 1.23лв. VAT Incl. 1.17лв. VAT Incl. 1.10лв. VAT Incl. 1.04лв. VAT Incl. Power socket connector АC, C14(E), 250VAC, 10A Connector IEC 60320, version: C14 (E). Power supply connector C14, 250V, M, 10A Power supply connector C14, 250 VAC, M, 10 A . Power AC socket AC-006A, C8, M, 2.5A, 250V Power AC connector, AC-006A, C8, M, 2.5 A, 250 V.
Power socket AC, DB-14-F3-DD+RS601, 10A / 250VAC, male, Fuse slot AC power socket, DB-14-F3-DD male with RS601 switch slot and fuse slot. 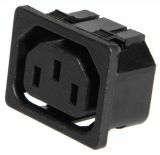 The connector has a rated current of 10 A contacts and a nominal voltage of 250 VAC.